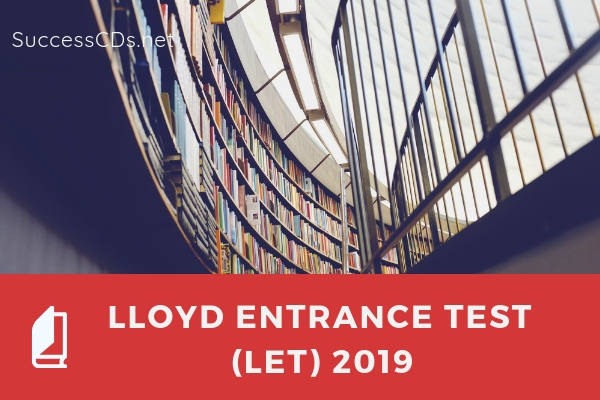 Lloyd Law College Entrance Test LET 2019 - Lloyd Entrance Test (LET) 2019 is conducted by Lloyd Law College for admission to BA LLB (5 yr.) and LLB (3 yr.) Program for the academic year 2019-20. Eligible candidates can apply for LET 2019 from the official website. LLOYD Law College has released a notice regarding the availability of application form and Admission process. Candidates can check the details of the application process, eligibility criteria and other important information on this page below. B.A. LL.B. - 5 Year (Integrated Program) - B.A.LLB is a five-year program which follows semester system. There are two semesters in each academic year. LL.B. is a three-year Program, which follows semester system. There are two semesters in each academic year. To be eligible to appear for LET-2019, a candidate must have passed his/her Higher Secondary School/Intermediate Examination (10+2) or its equivalent examination with not less than 45% marks in aggregate (40% in case of SC/ST). Candidates who have appeared in the 10+2 examination and are awaiting results are also eligible to appear in the LET Test. To be eligible for admission in the LL.B.-3 Year Degree Program, the Candidate should have passed Graduation (10+2+3 pattern) in any discipline of a recognized College/University, having secured minimum 45% marks in aggregate for General Category, 42% for OBC & 40% marks in aggregate for SC/ST Category. Candidates appearing/appeared for the Annual Examination in March/April are also eligible to apply. All offers of admission by 'LET-2019' shall be provisional and subject to the approval of Chaudhary Charan Singh University. The paper consists of questions based on subjects such as General Knowledge and Current Affairs, English Language, Legal Aptitude and Legal Awareness as well as Logical and Analytical Reasoning. Admission to the BA LLB (5 year) and LLB (3 year) Integrated program is made strictly on merit-based result of the Lloyd Entrance Test "LET" and Personal Interview of the student. Stage of Selection for admission in BA LLB program: (i) Entrance Test LET, (ii) Personal Interview and (iii) Merit. General Knowledge & Current Affairs: This section will test General knowledge & current affairs. Mathematics: This section will test candidate's Knowledge of elementary mathematics upto 10th standard. Logical Reasoning: The purpose of the logical reasoning section is to test the student's ability to identify patterns, logical links and rectify illogical arguments. Legal Aptitude & Legal Awareness: This section will test the legal aptitude of the students. Questions will be framed with the help of legal propositions (described in the paper), and a set of facts to which said proposition has to be applied. Some propositions may not be true in the real sense (e.g. the legal proposition might be that any person who speaks in a movie hall and disturbs other that are watching the movie will be banned from entering any movie theatre across India for one year). Candidates will have to assume the truth of these propositions and answer the question accordingly. The candidate has to then click on Create New Account and proceed to fill in their name, E Mail ID and mobile number. Once the account has been created, it will take the candidate to the registration form. The candidate has to fill in all the mandatory fields in the application form and then click on to save and continue to payment. The registration fee can be paid online through any of the various modes provided there. The details of the form shall be sent to the candidate on their registered E Mail ID through an acknowledgment letter. The candidates who wish to apply through offline mode are required to visit www.lloydlawcollege.edu.in and look for the link “To Apply Offline, Download Application Form Here”. On clicking that link, the application form shall open in PDF format. The candidate is required to take a print out of that form and fill in all the entries correctly and paste their photograph at the given space. The registration fee can be paid by a Demand Draft or Cheque, drawn in favour of Lloyd Law College, payable at Greater Noida. The complete application form along with the Demand Draft/Cheque has to be sent by registered post to: The Organizing Committee, Lloyd Entrance Test ‘LET 2019’, Plot No. 11, Knowledge Park II, Greater Noida- 201306.